Combined VLA and GBT image of the Galactic center. Credit: NRAO/AUI/NSF Yusef-Zadeh, et.al. In an Electric Universe, the observed association of non-thermal radio filaments (NRF's) with star-forming regions is expected. The region within 900 light-years of the Milky Way Galaxy's core is crisscrossed with glowing filaments 1 to 3 light-years thick and 10 to 100 light-years long. They are a recent discovery, known only since the invention of modern radio and infrared telescopes that can "see" through the visually opaque dust clouds shrouding the galaxy core. 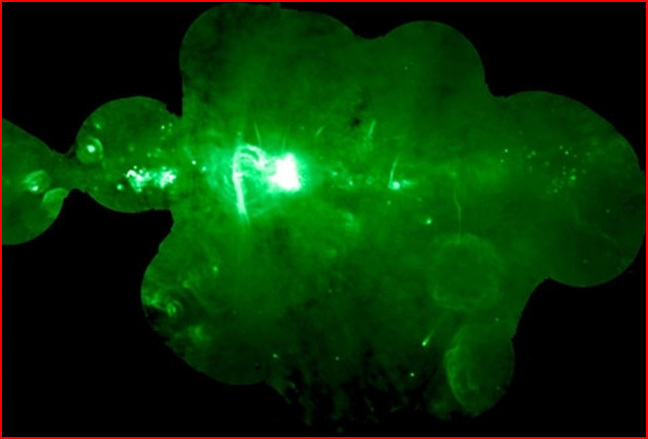 The latest radio telescope probes of this region show that the filaments are associated with pockets of star-formation. Researchers admit that the exact mechanism that creates the filaments remains to be discovered, but they suggest that one possibility is the collision of winds blown off by individual stars. For the Electric Universe, the association of non-thermal radio filaments (NRF's) with star-forming regions is expected. However, the argument is turned on its head. The filaments are gigantic Birkeland Currents--transmission lines feeding electric energy into star-forming regions and the galactic center. They are the prime cause of star formation and other activity at the galactic center, not an effect. All star-forming regions--even all individual stars--have similar filaments. The majority of the filaments are not seen in normal light. They are detectable only by their influence on the gas and dust stretching between the stars. But in a few places, including the region near the galactic core, electric power is concentrated so that the star-feeding currents glow. Since the power source is electrical, a gravitational black hole is not needed to explain the energy pouring from the focus of galactic currents at Sgr A. Please check out Professor Don Scott's new book The Electric Sky.